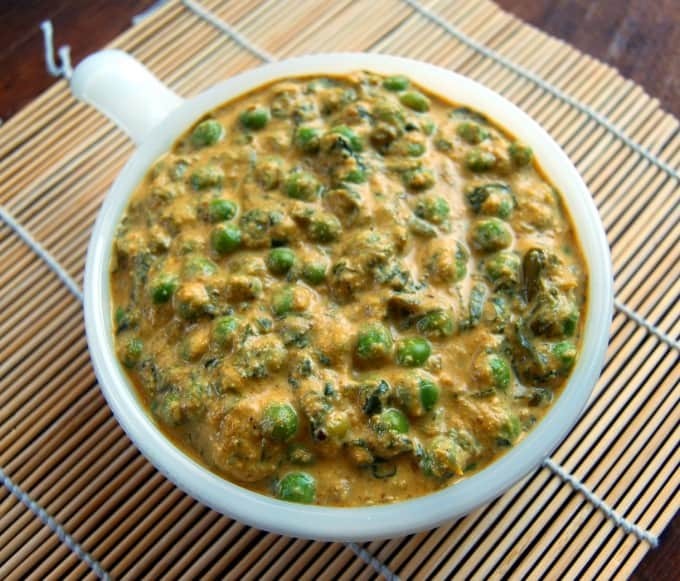 Methi Matar Malai is a sumptuous Indian dish of green peas in a creamy, rich sauce, often found on restaurant menus. For my vegan version, I use a smooth cream of almonds that tastes just as delectable and rich, but is far healthier. 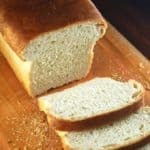 A gluten-free recipe. It was Steinbeck’s birthday yesterday. When Desi and I were living in Bombay, we went through a Steinbeck phase when both of us were constantly reading, discussing, and living, or so it seemed, this great American writer. We breezed, like addicts, through Grapes of Wrath, East of Eden, and Of Mice and Men. We questioned Dom Moraes’s sanity (anyone remember him?) when he called the ending of the Grapes of Wrath “the cheesiest ever” in English literature. We even named our rescue dogs after Steinbeck characters. There was Sam, a handsome, slender mutt with the straightest tail you ever saw on a dog. We picked him off the streets in Thane. A stray dog has given birth to a litter behind a new shopping mall and when Desi squatted down to look at them, one walked right into his arms. We brought him home. Sam, although named after the gentle Samuel Hamilton in East of Eden, had a rebellious streak and a tendency to get into all kinds of trouble. He loved to escape from the apartment and roam the streets when he had a mind to, which often put him at odds with territorial stray dogs who dominated the neighborhood. Not to mention neighbors, some of who would — literally — stand atop a chair and squeal in fear if a dog happened to be within sight. Luckily for him and us, the only time he ever got into a real mess was when he stumbled into one of the shallow gutters that line the city’s streets and came home covered in grease. Desi must have spent five hours straight scrubbing him that night. Not long after Sam came home, we became parents to another little puppy who we named Lee after the sage-like cook in East of Eden. We came across Lee one night on our way home from work — he was hiding away in a little nook inside the apartment building where we lived. He looked hungry so Desi took him a saucer of milk which he lapped up rightaway. We gave him a towel to cushion him from the concrete floor, but left him where he was — we lived in a tiny apartment, both of us worked odd hours at the newspaper, and we already had one dog who kept us on our toes, so we were definitely not looking to bring home another. But the next day, as we came home from work and were making our way up the stairs to our fifth floor apartment, we heard a tiny squeal behind us. We turned around and there was Lee, all two or three pounds of him, struggling to follow us. “Oh, look, he wants to come home,” said Desi, the biggest sucker on the planet when it comes to animals. And so Lee came home. India’s streets are filled with beautiful puppies like Sam and Lee who would make great pets, and a number of rescue organizations have sprung up in the city in the past decade — like World for All— that are working hard to spay, neuter, and adopt them to good homes. But the supply far outweighs demand. And paralleling this trend is another, insidious one where more and more people are buying purebred dogs from indiscriminate breeders. Many of these breeders steal dogs to get their business going and keep the animals in deplorable conditions where they are crammed into cages, hardly fed, and never walked or exercised. And things get worse. Even puppies that get sold to homes are often dumped on the streets once they grow up because the people who bought them are unwilling to put in the work it takes to look after a dog. Each year here, in the United States, millions of dogs — and cats– are put down because they can’t find homes, while breeders and puppy mills do brisk business, thanks to “dog lovers” who would rather buy than adopt. In India, the stray dog population continues to explode even as people who see dogs as symbols of affluence flock to buy designer pets from questionable breeders. The dogs are right. We are nuts. 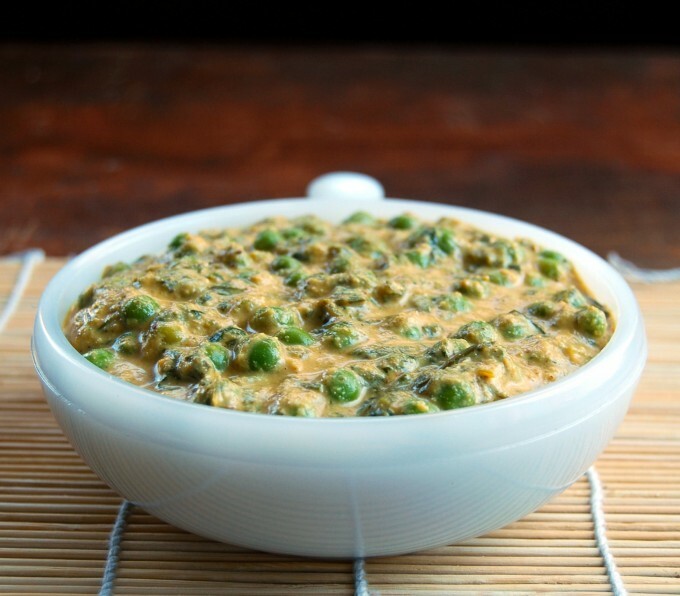 Methi Matar Malai is the beautifully alliterating name of a creamy, sumptuous dish often found on Indian restaurant menus. 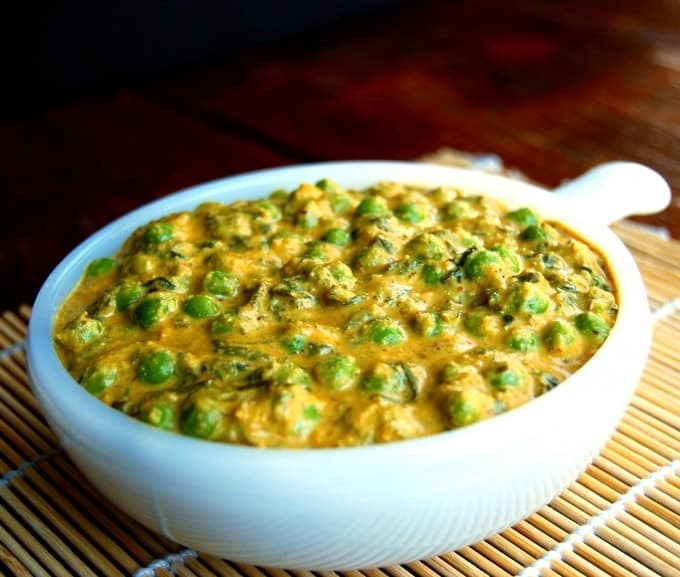 With the contrasting flavors of the two vegetables it features– wonderfully bitter methi or fenugreek leaves, and sweet, delicious green peas — this dish would delight the finickiest tastebuds. But better still, it’s incredibly healthy. Okay, let me backtrack here. 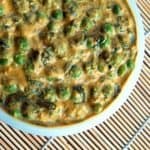 The Methi Matar Malai you’d find in a restaurant would not be healthy because it would contain malai, or cream, which is of course full of cholesterol. 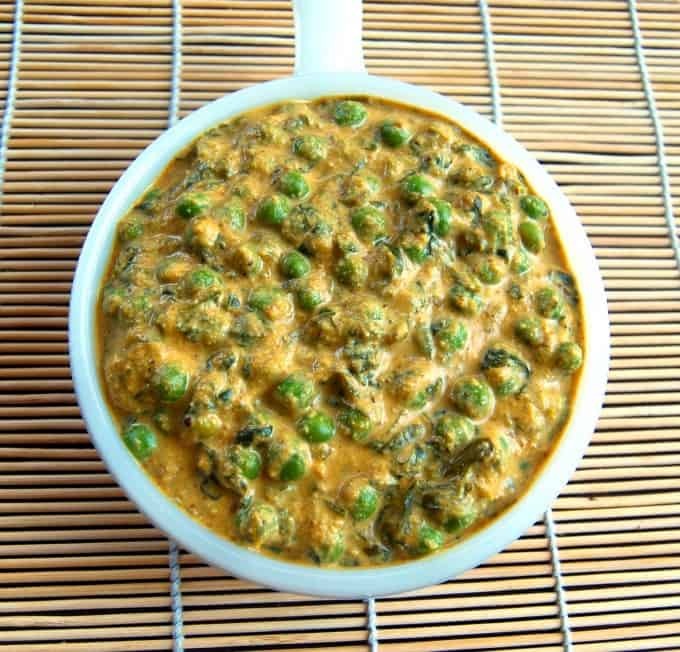 But the vegan Methi Matar Malai I am serving up today is made creamy by a smooth paste of heart-healthy almonds. 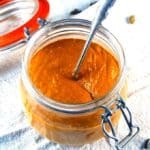 As you know, I often use nut creams to substitute for dairy creams in Indian recipes, and the result is always both delicious and nutritious. 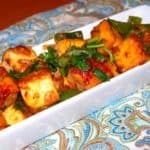 If you are not familiar with methi, you should hunt it down at your local Indian grocery store. 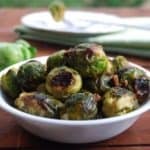 This super-veggie is great for diabetics, and it helps lower cholesterol and normalize blood pressure. And that’s just the beginning. Methi aids digestion, flushes out toxins in the body, is great for skin and hair, and helps stimulate weight loss. Now how can anyone say no to all that? Soak the chopped methi leaves in a big bowl of warm, salted water for 10 minutes, then drain and set aside. Blend the almonds with the soaking water into a smooth paste. Set aside. Heat half the oil and add the cumin seeds, coriander seeds, green chillies, onions, garlic, ginger, cloves, cinnamon, and peppercorns. Saute everything until the onions turn translucent and just start to brown. Add the tomatoes along with the cayenne and turmeric. Saute until the tomatoes are quite broken down and pulpy. 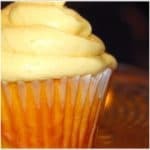 Remove the mixture to a blender and cool if necessary before blending into a smooth paste. Add water or vegetable stock if needed. Heat the remaining oil in a saucepan and add the drained methi leaves. Add a pinch of salt and saute until the methi starts to express water. Cover with a lid and let the methi cook on medium heat for another 10-15 minutes until tender. Add a tablespoon or two of water if necessary to prevent the methi from sticking to the pan. 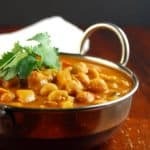 Add the tomato-onion paste, garam masala, and the green peas and continue cooking on an open flame, stirring frequently, for another 5 minutes. Add the almond cream and mix well. 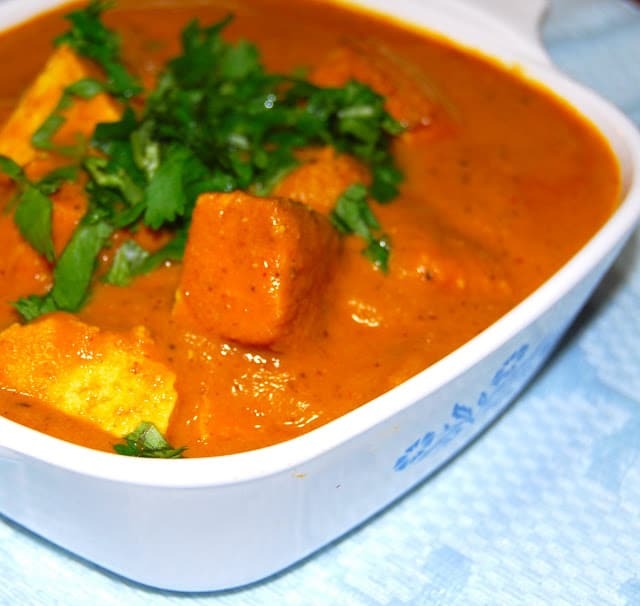 Turn off the heat once the curry begins to simmer. 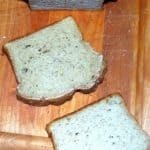 Check salt and add more if needed. 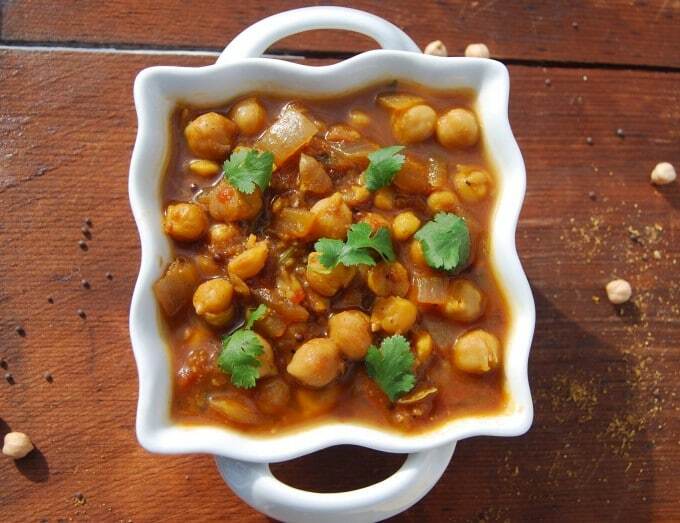 Serve hot with chapatis, rotis, or pooris. Just below our building, on the street, we see numerous pups take birth, grow and later roam the neighborhood just like their parents, at least twice every year. Other than feeding them we have no idea what else we can do for them. 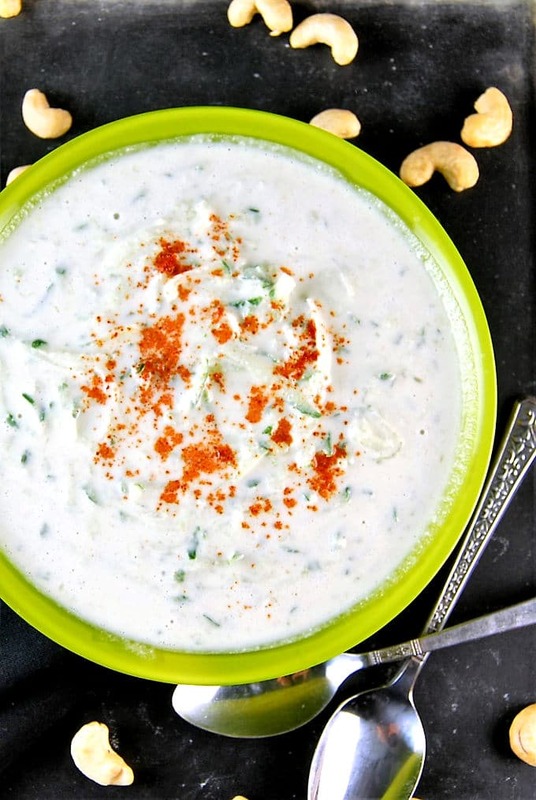 This version of the mmm seems so simple and light … sans all that malai etc. Lovely pics too Vaishali. Hi Sharmila, it’s really a sad situation for animals born on the streets in India, but at least some organizations are now springing up and there are more spay and neuter programs, although more work is needed for sure. And education is key so more people adopt puppies born to stray animals, instead of buying from breeders. Loved your piece connecting Steinbeck’s characters to your pets. Really enjoyed reading it! G’day! 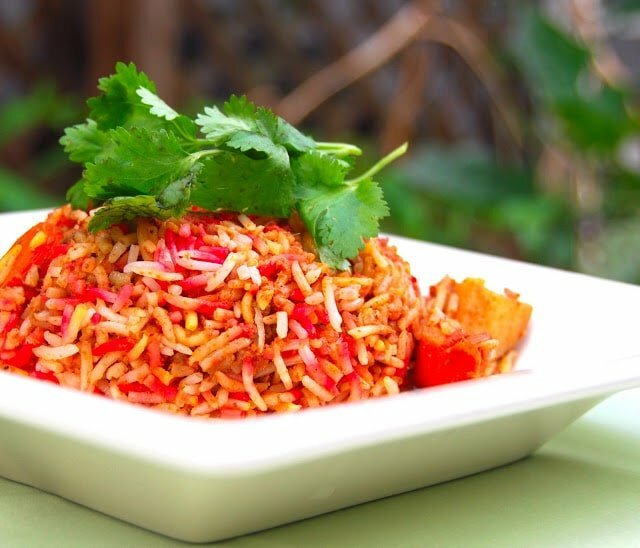 looks like a very warm and welcoming dish! YUM! Viewed as part of Nancy’s YBR Round Up! 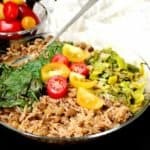 Can I use raw cashews instead of almonds? 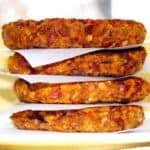 Also, my family loved the vegan Aviyal! Hello Vaishali, I have been a reader of your blog, but never posted earlier. In any case I wanted to say how much I resonate with your ideals and thoughts on animals and choice of diet. I too have had pets, all rescued from the streets of Mumbai. I cannot express how much they have enriched my life right from my kitty whom I found when I was 8 to the two puppies I have currently, one of whom is a Katrina survivor. Love your blog and keep doing what you have been doing. I just discovered your blogs. 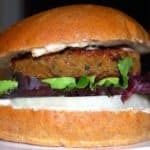 My daughter ( Vishali) has turned vegan and your recipes are going to be such godsend for us! Thank you. Totally share your views and sentiments on dogs. Looking forward to trying many if your recipes!